This is a shadow box display case. The glass on this shadow box display case is tempered. Tempered glass is much safer and more durable. There are two adjustable shelves which are great for fitting different sized items on display. There is a mirror back that reflects light back into the shadow box helping increase the visibility of the products on display. 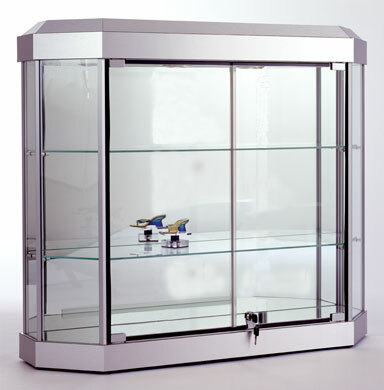 For security purposes locking hinged doors are installed on this shadow box display case. The dust resistant design keeps your items as clean as possible. Three 50 watt halogen top lights illuminate the inside of this shadow box evenly and consistently. Shadow boxes are a great way to make use out of your unused wall space. They can be wall-mounted or recessed into the wall. These shadow box display cases are shipped fully assembled and ready to install. If the dimensions of this shadow box display case do not fit the needs of your space you can supply us with your own dimensions for a custom built shadow box. Please specify width, height, depth, number of shelves backing and finish and we will give you a price quote.